News Letter state up to date with what is going on. 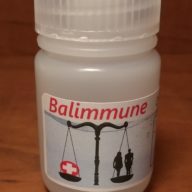 Balimmune is a life dream coming into reality. A couple of boys passion for science and technology that spanned generations. A story of hardship journey and the American spirit to not give up ever. To forge on and keep going. To fight the good fight and be a blessing not a burden. To help community and share the spirit of God and Dreams that have become a reality. God Bless you and yours and may your journey be blessed.